Over Thanksgiving, I was able to see a lot of my family, including a 19-year-old cousin of mine who is going to France over college winter break. She’s traveled before as an exchange student, but this time though, she wanted to be able to use her iPhone using data instead of just relying on WiFi. I was pretty proud of myself! Offering technology help to a 19-year-old girl! I thought kids would be much more ahead of the curve than I am. Anyway, as I started to explain to her and her mother what some of the options were, and what to do to ensure you don’t use excess data while abroad, I realized I’d have to compile everything into an email, complete with screenshots, for it to really make sense. 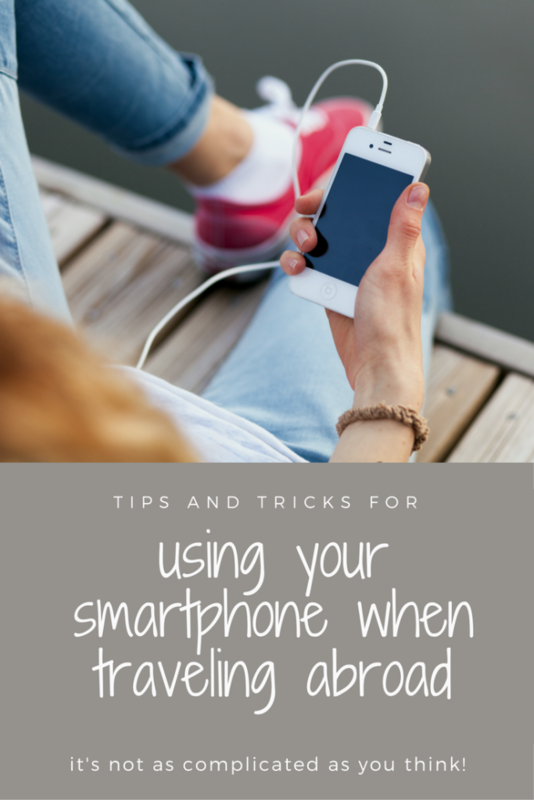 I realize that for seasoned travelers, this may be common knowledge, but since it became apparent to me that it’s not clear to everybody, I thought I’d share my tips with you all! First, you’ll want to research the international data and voice plans offered by your carrier. 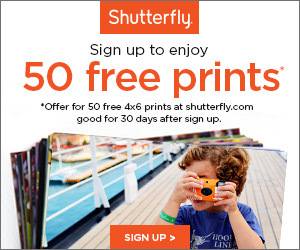 ** We use AT&T, and they have different plans available, and pricing usually varies based on your travel destination. For instance, Canada, Mexico, and Western Europe have less expensive data rates, while data rates in Asian countries are more expensive. Here’s a good overview of the plans through AT&T. 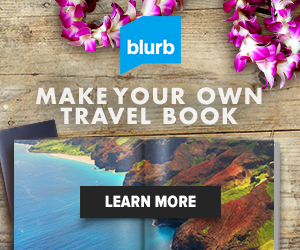 Sign up for the plan that you want right before you leave on your trip. When we went to Russia in February, I had signed up for the 120MB plan. Unfortunately I went over that 150MB of data within the first week, so I had to upgrade to the 300MB plan. No big deal. When you get to your destination, you MUST enable data roaming for your international data to work. Simply because you signed up for an international data plan does not mean that your data is going to magically work abroad. On your iPhone, go to Settings > Cellular. 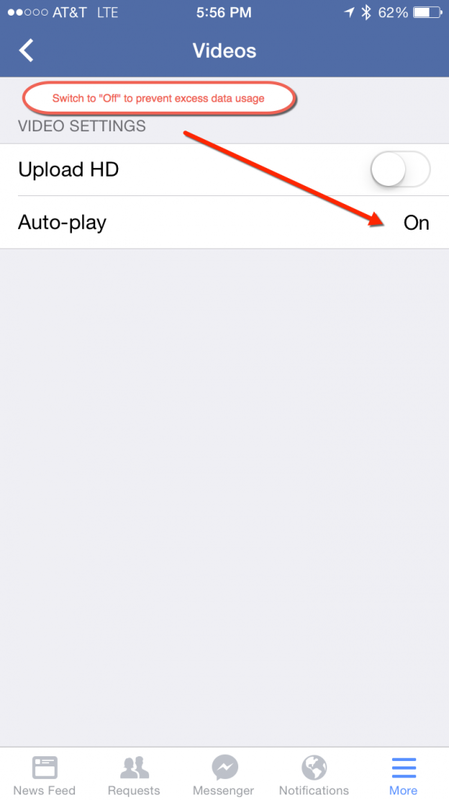 Then toggle the “Data Roaming” switch so that it is green. If you ever want to ensure that you don’t transmit ANY data while you’re abroad, you can always turn data roaming back off. For instance, if I’m hooked up to WiFi (like in the hotel for the night), sometimes I’ll turn off data roaming. But keep in mind that only iMessage will be able to transmit if you turn off data roaming (meaning no regular text messages if you have friends/family that don’t use iMessage/don’t have iPhones). Right before you depart, it will be a good idea to reset your data usage statistics. 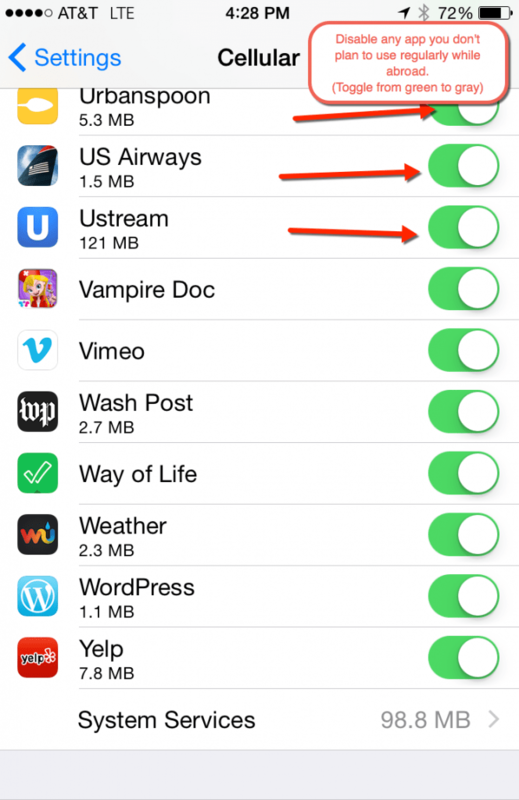 That way you can keep track of how much data you have used while on your trip. For instance, if you signed up for the 300MB data plan, you can see if you’re approaching the 300MB. 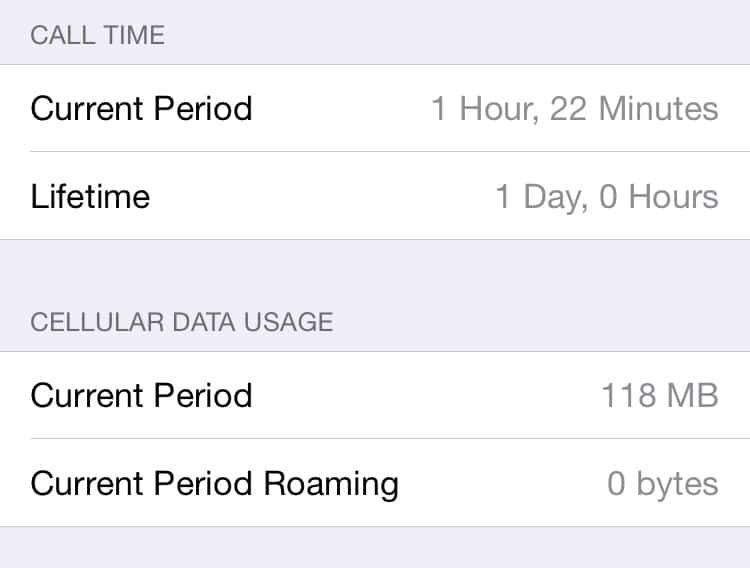 To reset your data statistics, again, go to Settings > Cellular. Then scroll all the way to the bottom, and it will say “Reset Statistics.” After you reset the statistics and you scroll back up, your “current period” Cellular Data Usage statistics will say 0 bytes. I usually check these statistics about once a day when traveling, especially to make sure I’m not using data faster than expected. To make sure that apps don’t start using phantom data (in other words, continuing to use data in the background, even if you aren’t actively using the app), you can disable apps to prevent them from using any data. For instance, I might leave Mail and Facebook enabled, but I certainly don’t need any games enabled that I keep on my phone for my niece and nephew, or the weather app, etc. You can disable those in Settings>Cellular. Pretty much every app on your phone will be listed on that page. Any app that is toggled on (with green), just toggle it off, and it won’t use any cellular data. 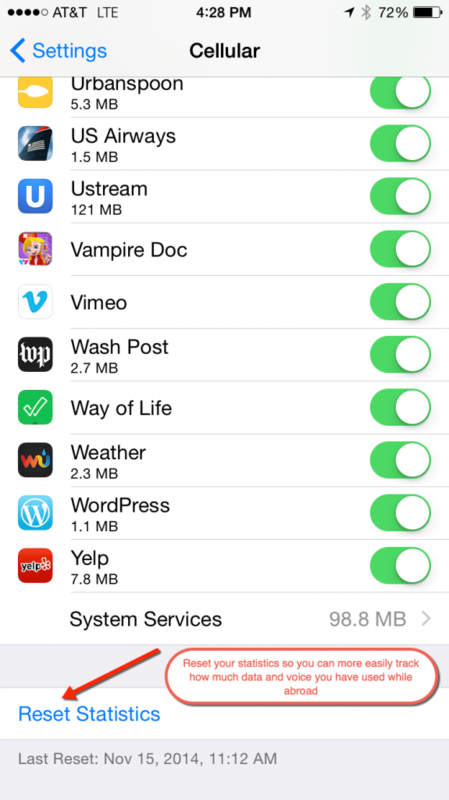 If you have a lot of apps, it’s kind of annoying to turn them all off, but it should go quickly. And, if you need to use a specific app while you’re abroad, you can always just go back into this screen and re-enable the option for that app to use cellular data. 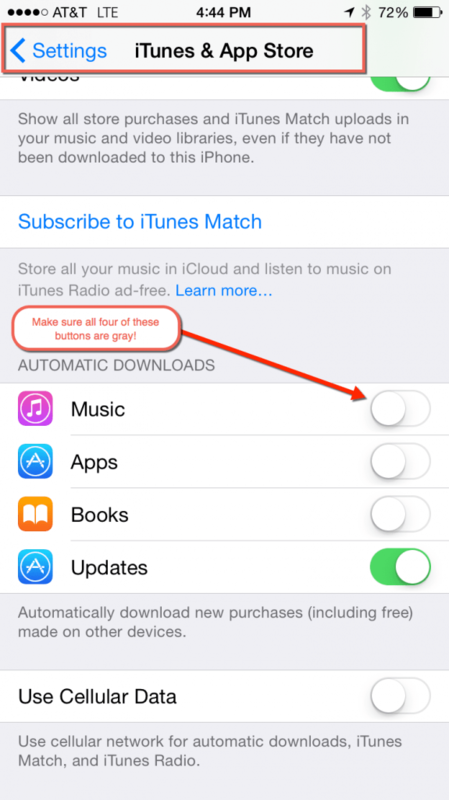 Make sure that you disable the setting to have app updates update automatically in the background, or any music or podcasts that might download automatically. This way none of your apps will automatically download an update if one is available. 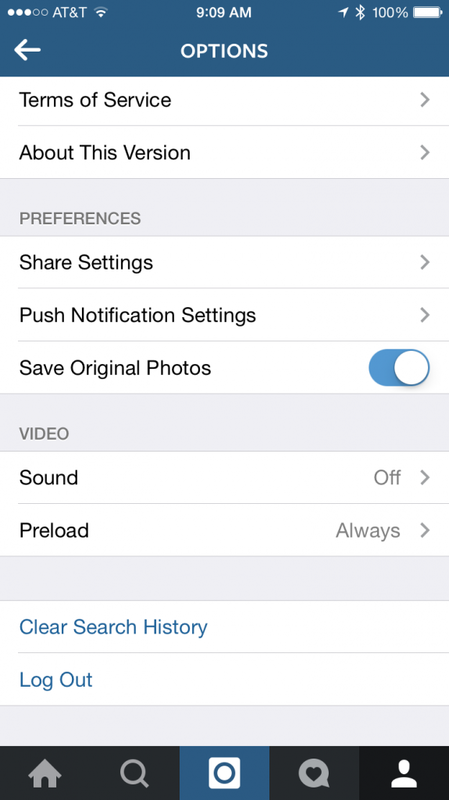 That’s under Settings > iTunes & App Store. Make sure all the switches are toggled to gray instead of green. There you have it! 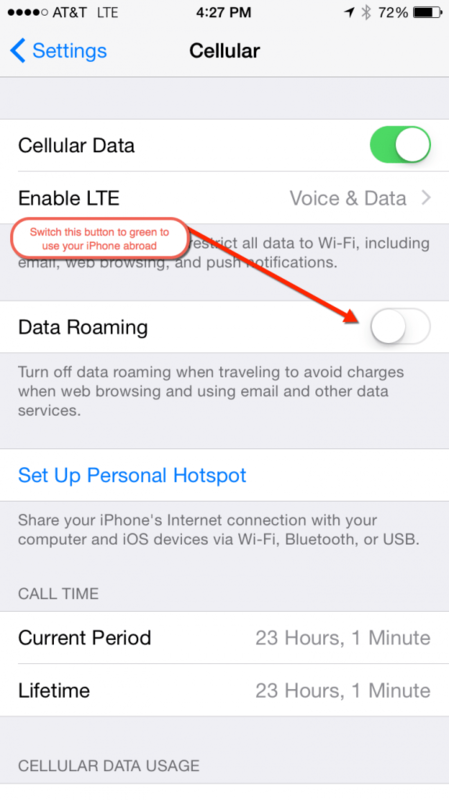 All my tips for using your iPhone abroad, and how to ensure that you don’t use excess data. Hopefully this goes without saying, but if you are trying to keep your data usage very low, limit things like picture uploading until you are back on a WiFi connection. I have found that if you need to call AT&T from your cell phone for assistance, they have always waived the voice minutes. Of course, your situation could vary, but we’ve never had a problem. When you return to the United States, you must call to cancel all your international services. It’s billed monthly whether you’re using the international data or not, so it’s up to you to cancel everything! ** Some folks will swap out their SIM card with a SIM card from a local cellular company as a less expensive option. I have never tried this because A) I want to be able to use my phone the moment the plane lands. I don’t want to have to worry about finding a cell phone store, B) I really don’t find my carrier’s data plans to be overly expensive, and C) It’s just really convenient.